The Milwaukee Brewers today announced the team’s full 2016 promotional schedule. This season’s jam-packed calendar is filled with 14 All-Fan Giveaways, three brand new All-Kid Giveaways, the return of the Brewers Postgame Concerts and much, much, more. Six bobbleheads, a Bob Uecker Talking Alarm Clock and the addition of three All-Kid Giveaways highlight the list of items that will be given away at Sunday afternoon contests at Miller Park this season. 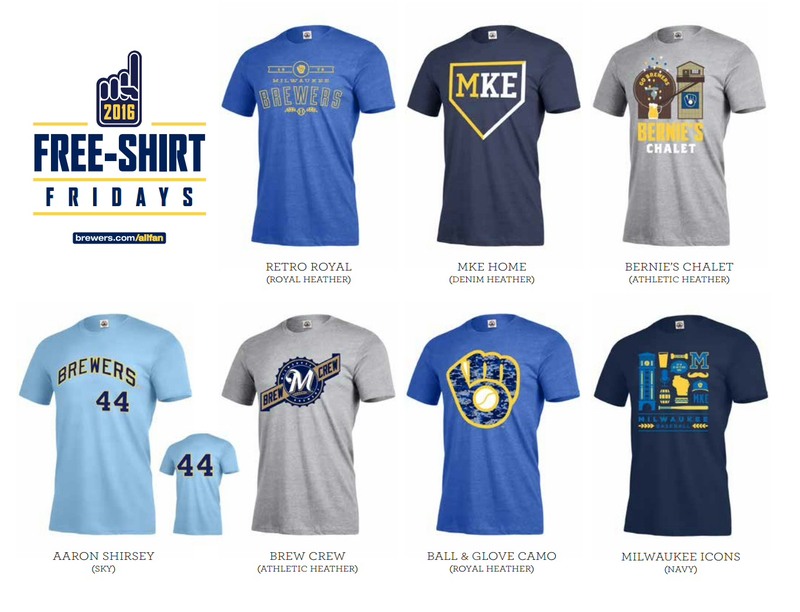 In addition, the Brewers will continue Free-Shirt Fridays for the third straight year. Seven different T-shirts will be given away throughout the season, including one at every Friday home game at Miller Park from June through August. The T-shirt designs were chosen as part of an online vote and were revealed on stage at Brewers On Deck. 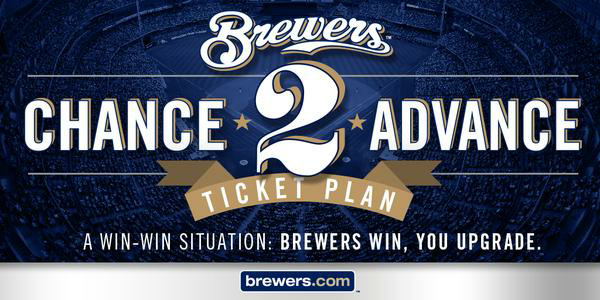 Additional information about this year’s All-Fan Giveaways is available at Brewers.com/allfans. New for the 2016 season is the addition of Kids Eat Free Sundays. Every Sunday home game, all kids 14 and under will receive a voucher upon entrance to Miller Park good for a free hot dog, apple slices and a bottle of water. If that wasn’t enough, the Brewers are excited to also announce three All-Kid Giveaways this year. All kids 14 and under who are in attendance will receive a Jonathan Lucroy Replica Jersey on May 15, courtesy of Kwik Trip, a Paint-Your-Own Bernie Bobblehead on May 29 and a Jonathan Lucroy Chest Protector Backpack on August 28, also courtesy of Kwik Trip. Thanks to the success of last season’s inaugural series, the Brewers are proud to host two Postgame Concerts in 2016. On Saturday, May 14, the Brewers will welcome one of the music industry’s hottest stars to Miller Park as multi-Platinum pop artist Andy Grammer will perform a full-length, free postgame concert, courtesy of Pick ‘n Save, following the Crew’s matchup with the San Diego Padres. Then on Saturday, August 27, country music star Kip Moore will take the stage following the Brewers vs. Pirates game, presented by 94.5 KTI Country. In addition to the many giveaways at the yard this year, the Brewers will bring back the 5-County, 5-Day Celebration, Spring Madness (414), Student Nights, Miller High Life Mondays and Kids and Senior Citizens Discount Days. Fans in the region will want to head to Miller Park from April 20-24, as residents of Milwaukee, Ozaukee, Racine, Washington and Waukesha Counties can purchase half-price tickets during the team’s annual 5-County, 5-Day Celebration. Another great deal for fans comes around Memorial Day weekend, May 27-30 as Spring Madness (414) returns. Fans can save 50% on select seats while enjoying special “414” concession pricing with $4 16oz beers, $1 hot dogs & small sodas and $4 nachos. Fans looking for start-of-the-week fun will want to check out the return of Miller High Life Mondays, which feature a new lower price this year. Terrace Reserved tickets are just $6 for all Monday home games with a 6:20 p.m. start time, courtesy of Miller High Life. Also returning in 2016, most weekday afternoon home game kids 14 and under and seniors 60+ save 50% on tickets on Kids and Senior Citizens Discount Days. Students are also invited to take in the fun with a great deal as every Friday home game is a Student Night, where those in high school and college can purchase $10 Terrace Reserved or $15 Loge Bleachers tickets. On top of that, students can enjoy a special $3 Happy Hour menu – featuring hot dogs, nachos, soda and beer – through the end of the first inning. 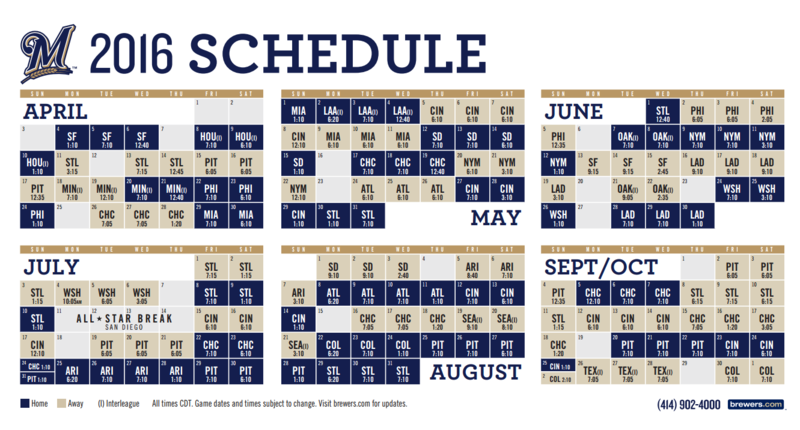 The complete 2016 promotional schedule is available at brewers.com/promotions. 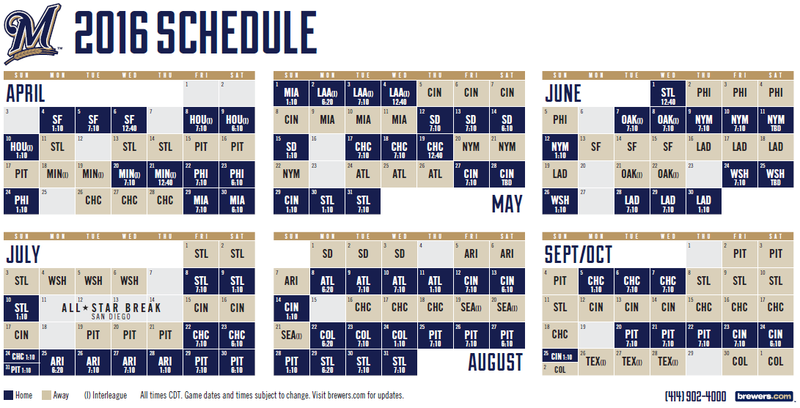 Click on it to download a copy of the full 2016 Milwaukee Brewers schedule with all road games’ start times filled in. The Milwaukee Brewers announced today that the team will close the Spring Training schedule with an exhibition game against their Double-A affiliate, the Biloxi Shuckers. 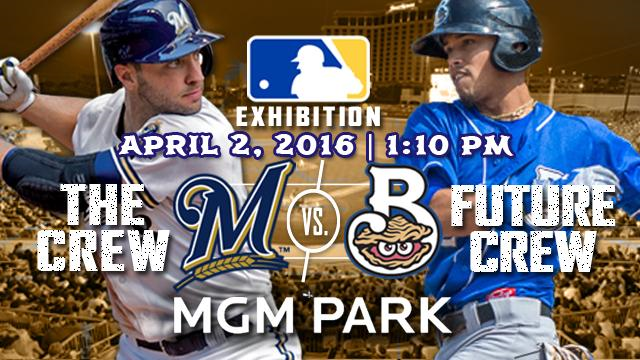 The game will take place on Saturday, April 2 at 1:10 p.m. CT at the Shuckers new ballpark, MGM Park. This is the first time the Brewers will play in Biloxi. It is the first time a Major League team has visited the Gulf Coast city since the 1935 Washington Senators held Spring Training at Biloxi Stadium, which is now the site of Keesler Air Force Base. The Brewers will announce their complete Spring Training schedule at a later date. Milwaukee will open up the regular season on Monday, April 4 at Miller Park against the San Francisco Giants. The Milwaukee Brewers have announced that the team will auction off Opening Day tickets for the 103 “Uecker Seats” located at Miller Park. The Dutch style auction will be held exclusively online beginning today, Monday, March 23 at 12:00 p.m. until Tuesday, March 31 at 11:59 p.m., with all proceeds benefiting the Make-A-Wish Foundation. The “Uecker Seats” are 103 obstructed view seats that are located in Sections 421, 422 and 423. The seats were named after Brewers’ legendary announcer Bob Uecker and the famous Miller Lite “All Stars” campaign. The ad campaign featured Uecker’s famous tagline, “I must be in the front row,” despite the fact that Uecker somehow always ended up in the last row. The seats are located near the Last Row Statue of the announcer, which was unveiled last year, in the last row of Terrace Level Section 422. The Dutch auction will be held exclusively online and there is no limit of the number of seats fans will be able to bid on. There are a total of 103 seats that will be auctioned off, with 42 pairs available and 19 single seats. Each participant can log on to brewers.com/UeckerSeats starting today, Monday, March 23 at 12:00 p.m. From there, fans can chose the pair and/or single seat options, and make their desired bids. Once the auction closes on Tuesday, March 31, the top bidders for each category will be selected. The final price for each seat will be the lowest bid among the top bidders selected. Auction participants will be contacted by the Brewers Ticket Office if they have the winning bid. All proceeds from the auction will benefit the Make-A-Wish Foundation.